Discover how you can quickly increase your chances of accurately predicting your next sales quarter… and every future quarter. Every self-respecting business relies heavily on forecasting as part of its sales management strategy. Unfortunately, traditional sales forecasting is not an exact science. Many sales managers, still base their quarterly predictions on historical stats (often of questionable accuracy) and a liberal sprinkling of intuitive guesswork. Small wonder that many managers feel acutely short-changed – fearing that their forecasts are little better than astrology. And it’s not only Sales Managers that feel deprived. Companies can be just as short-changed. According to AMR Research (arguably one of the most respected global research organisations), a 3% increase in forecast accuracy increases profit margins by 2%. But, have no illusions, the reverse holds equally true. Inaccurate predictions will decimate margins and destroy your profits. CRM platforms are data powerhouses. We can use them to harvest a wealth of information on customers, deals and prospects. Thanks to the detailed backlog stored in CRM platforms, it’s easy to dive into sales history, analyse past trends and make shrewdly educated predictions for the next quarter. As experienced Sales Managers, we can identify the tell-tale signs – such as frequent and positive customer contact… submitted RFPs… contracts sent for review – that indicate a healthy deal in prospect. Provided our data is complete and accurately up-to-date, we can analyse a deal and predict the chances of progression with forensic precision. But there’s one snag – this can only be done on a case-by-case basis. Scalability is our big challenge. But imagine there was a way to scale this capability very rapidly. This tool offers you automated deal predictions based on behavioural insight… and it’s infinitely scalable. 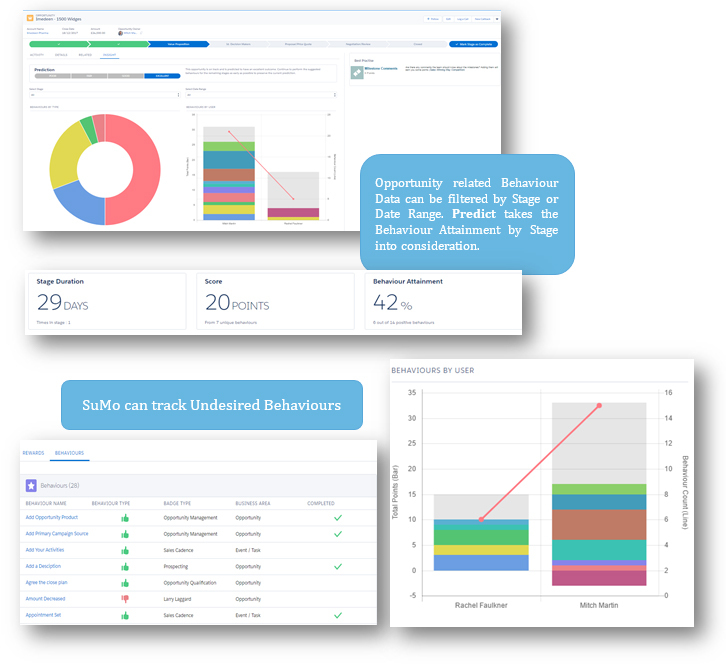 By silently tracking the behaviours of the users within CRM, the SuMo ‘Intelligent Predict Algorithm’ calculates the likely success of a sales campaign. This self-learning algorithm monitors every high value activity expected at each key stage of the selling process. The probability of success increases every time a sales executive performs a positive action (like meeting with a C-Level contact) or downgrades the chances of success whenever a negative behaviour (such as a deal value fluctuation) is recorded. For a start, this empirical view can help you to ‘qualify-out’ the less promising prospects. You can prune the ‘dead wood’ (or, at least, the stunted prospects) to concentrate your efforts and resources on the healthiest leads. It also opens the door to precisely targeted coaching – allowing you to manage your team’s performance with data-driven insights and to offer personalised support where necessary. What’s more, by monitoring your team’s behaviours you can swiftly highlight new gold standards of practice. Many companies are now optimising their sales process by studying and replicating the forward-thinking actions of top performers. And Artificial Intelligence (AI) is SuMo’s next great game-changer. AI gives us the ability to digest mass data and to process these multiple data streams into instant, intelligent, actionable decisions. AI is already bringing a new dimension to SuMo’s impressive capabilities and we confidently predict this will change the entire business and sales landscape. To learn more… to see SuMo in action… and to create your own early warning sales system you can simply click this link.